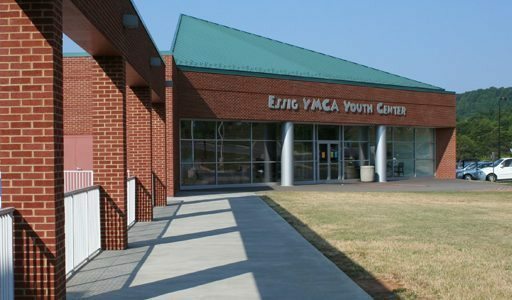 Focused around serving local youth and expanding the arts among young people, the Essig Youth Center is a unique facility situated adjacent to the Franklin County Family YMCA’s Recreation Center and a protected wetlands area in Rocky Mount, Virginia. MB Contractors recently completed this addition project, creating excellent facilities for local youth while being sure to protect the delicate ecosystem native to the adjacent wetlands. The youth center facility features a lobby that includes a beautiful and inspirational art gallery and reception area. Inside, you’ll find facilities for an all-day preschool, children’s fitness area, a “black box” theatre for community events and performances, two aerobics and dance studios with floating wood floors, art and music classrooms, and a full-court gym with six baskets and indoor soccer goals. Exterior work on the new youth center included the construction of an outdoor patio with beautiful views of the wooded park and playing fields. We also carefully constructed a serene new walking trail through the neighboring protected wetlands area. MB Contractors took this environmental challenge very seriously, and the nearby protected wetland area remained at the forefront of our minds during planning and construction. Our team worked directly with the Virginia Department of Environmental Quality to develop a detailed mitigation plan, protecting the entire neighboring wetlands and ensuring they were not disturbed during construction. Our team is very pleased with the new youth center we were able to deliver, and we’re proud to have demonstrated our ability to manage environmental challenges as well. Copyright 2016 MB Contractors. All Rights Reserved.